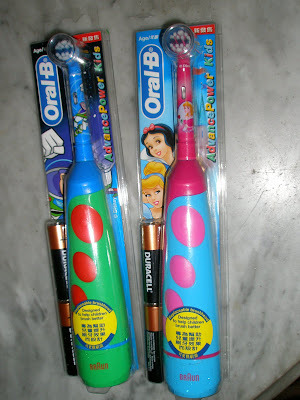 MY TWINS ALSo had these electric toothbrushes (their aunt bought for them from UK). I personally thing this is not necessary..they should be brushing with their own effort thought by the school dentists and not rely on the electronic gadget. Anyway after sometime the “toy” just lying around with cobwebs..and also chnaging batteries is not cheap, too. Alamak. We r also using the Colgate electronic one. But sometimes, we also use the el cheapo ones. The electronic ones are good cuz you know then that you’re definitely getting the dirt out where as the manual ones, you may miss some dirt. That’s what my dentist said. Heheh..I remember you blogged about some Tesco ones? Guess Daddy just couldn’t resist. Sometimes, I wonder..who really wants it..Dad or kids.